Latino writers have found a home at Huizache magazine. The recently released publication is one of the few literary magazines devoted to the works of Hispanic writers. Huizache features the works of nearly a dozen Latino authors. Sandra Cisneros has a terrific essay about meeting her idol, tango composer Astor Piazzolla. Lorraine López and Estella Gonzalez contribute short stories. Gary Soto, José Montoya and Benjamin Alire Sáenz wrote poems. 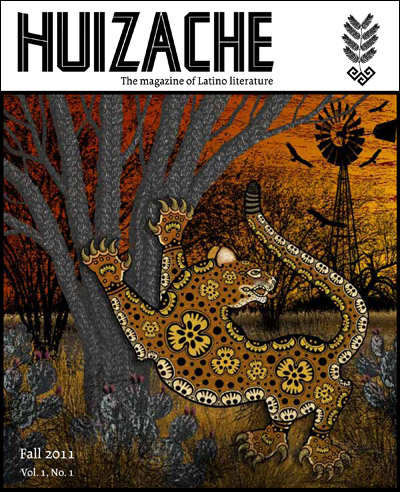 Huizache is a literary magazine produced by CentroVictoria, the Center for Mexican American Literature and Culture at the University of Houston-Victoria. Dagoberto Gilb serves as the center’s executive director, and Diana López is the magazine’s editor. The center also produces the Made in Texas teacher’s guide, which features lesson plans in Mexican American literature. Huizache editors said they hope to produce it annually, according to this Victoria Advocate article. You can order the magazine for $10 here. • The Acentos Review comes out online four times a year. Its upcoming issue is devoted to Hispanic elders. • The online Aztlán Reads, which calls itself “a database of Xicana/o Studies fiction and non-fiction work,” features poems, short stories, author interviews, giveaways and news about literary events. • The online Somos en escrito features a novel in progress, poetry and other works by Hispanics. Love the new literary magazine Huizache! As soon as I saw Dagoberto Gilb was starting up a litmag I preordered my copy right away. My favorite piece is Estella Gonzalez’ story. Just loved it. Can’t wait to see what’s in the next issue. Agreed. I think it only comes out once a year. I wish it was a quarterly publication.